Do automobiles that run on water really exist? Urban legends abound of cars that can run on water, or of special carburetors that can allow over one-hundred miles per gallon, but that such technology is being suppressed by the automobile industry and the oil companies. Could such rumors actually be true in a time when we are paying record high prices for fuel and trying to wean ourselves off foreign oil dependency, all while actively seeking to develop viable “green technology” that will allow cars to run on electricity? One may find themselves asking this very question once they learn that water driven and electric automobiles were actually designed, and produced, more than one-hundred years ago! Impossible you say? It’s true. Furthermore, some of these ancient automobiles of the future have survived; not hidden under a tarpaulin in some secret warehouse, but displayed in plain sight for all to see. One might be surprised to learn that the idea of a water driven vehicle has been around since the early 1800s. Take for example the invention of the steam engine which has powered machinery, ships, and railroad locomotives. It therefore seemed logical to brothers Francis and Freelan Stanley to build a steam powered automobile – in 1897! Others had attempted similar feats beforehand, but the Stanley brother’s invention actually worked! This was the dawn of the auto industry, when many inventors were designing and experimenting with cars of their own manufacture. The Stanley’s were among the first auto builders in America, ahead of Henry Ford, Louis Chevrolet, and Walter Chrysler, just to name a few. To prove the reliability and durability of their new invention, Freelan Stanley, in 1899, drove one of their steam powered cars to the top of Mount Washington thus becoming the first to scale the mountain in an automobile. This was a momentous technological feat for the day, and the publicity it generated certainly helped to advertise their product. The brothers produced two-hundred more “steamers” before selling the design rights to a now defunct automaker called Locomobile. In 1902 the Stanley brothers re-organized and formed the Stanley Motor Carriage Company, in Newton, Massachusetts, and began producing more advanced models of “steamers”. The “Stanley Steamer”, as it became known, used a gasoline burner to convert water to steam which powered a steam engine of Stanley’s design. The boiler was equipped with release valves in the event of excessive pressure buildup as well as other safety features to protect the vehicle’s occupants from a catastrophic malfunction. Early gasoline powered cars puttered and plodded along at maximum speeds of 15 to 35 miles per hour, but not so with a Stanley. In 1906, a Stanley Steamer drove 127 mph on a closed track in Florida thus setting a world speed record for the mile in an automobile – 28.2 seconds. Stanleys weren’t the only steam cars produced in the early 1900s and dozens of other manufacturers came and went. Locally there was the Binney & Burnham Steam Car Co. of Boston (1901 – 1902); the Central Automobile Co. of Providence, (1905-1906): the Crompton Motor Carriage Co. of Worcester, (1903-1905): the Kidder Motor Vehicle Co. of New Haven, (1900 -1901); the J. A. Moncrieff Co. of Pawtucket, (1901-1902); the Thompson Automobile Co. of Providence, (1906), just to name a few. Stanley’s closest competition came from the White Steam Car Company of Cleveland, Ohio. It could be argued that a White was slightly more technologically advanced than a Stanley as their automobiles were the first to utilize condensers to recover steam exhaust to recycle the water vapor. White also advertised their cars as being larger and more luxurious than a Stanley. The wheelbase of a White was 122 inches which translates to 10.16 feet – much larger than an average car on the road today. While some inventors worked to develop steam technology, others focused on electric powered automobiles. One might be surprised to learn that European inventors had been working on the concept as early as the 1830s. The first successful electric automobile produced in the United States was built by William Morrison, of Des Moines, Iowa – in 1891! The Milburn Wagon Company of Toledo, Ohio, produced the “Milburn Light Electric”, an automobile that ran solely by batteries which made for a virtually silent running car. Milburn’s “electrics” were utilized by President Woodrow Wilson and the secret service during his term of office (1912 – 1920), but generally only for parades. Milburn “electrics” were less costly then “streamers” but they had their drawbacks such as a maximum travel range of seventy-five miles, and a maximum speed of only 20 mph. However, unlike today’s hybrid electrics, Milburn’s were not small runabouts, but full-sized well appointed cars of the day. By the 1920s public interest in “steamers” and “electrics” had waned due to technological improvements to the gasoline powered internal-combustion engine that made it more powerful and reliable. A major improvement was the invention of the electric starter, thereby eliminating the old way of hand-cranking a motor to get it to start which was cumbersome as well as dangerous. By the 1920s fuel was cheap and plentiful, unlike a decade earlier when finding a gas station was a problem for the average automobile traveler. Perhaps the biggest factor which led to the demise of “steamers” and “electrics” was their price. 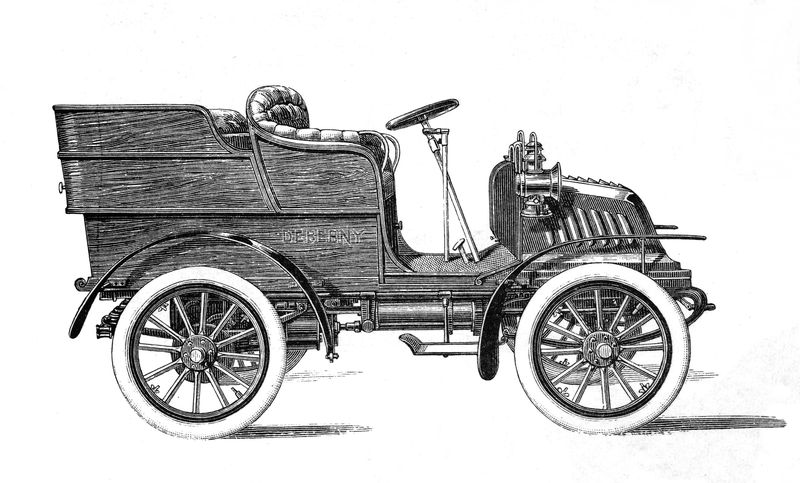 In 1909 a White steam car sold for $4,000, while a Ford touring car sold for $850. By 1915 the price of a Ford had dropped to $440. The wealthy who could afford to purchase a “steamer” could also afford other high-end, flashy brands of gasoline powered automobiles such as Stutz, Packard, and Franklin, just to cite a few. Thus the White and Stanley companies went out of business in 1918 and 1924 respectively. Examples of these “futuristic” automobiles have survived and can be found at museums and in private collections across the country. In Sandwich, Massachusetts, there is the Heritage Museum and Gardens. Among the museum’s extensive antique automobile collection one will see a 1909 White, a 1911 Stanley, and a 1915 Milburn Light Electric. The Larz Anderson Auto Museum in Brookline, Massachusetts, has two “electrics” in their collection; a1905 Electromobile, and a 1908 Bailey Electric. Electromobile’s were produced in England from 1901 to 1920, therefore making this car a rarity for America. Bailey Electrics were produced in Amesbury, Massachusetts, from 1908 to 1916. In January of 1914, a Bailey was driven from Boston to New York, and then on to Chicago while maintaining average speeds between 17 and 21.5 mph. The feat is even more amazing when one considers that most roads of that era were unpaved, and unplowed! Since World War II, automakers and independent inventors have experimented with electric cars, but “steamer” technology has been virtually ignored. One concern with steamers was the lack of a way to quickly regulate boiler temperature, but one would think that with today’s computer and refrigeration technology that this would be an easy problem to solve. Another drawback was the lag time between lighting the boiler and waiting for enough steam pressure to build before the vehicle could move, yet it would seem that modern technology could solve this problem too. Electric automobiles built between 1900 and 1920 were hindered by limited battery power storage capacity which limited travel distance, a problem that still plagues modern “electrics”. It is for this reason that some maintain that electric “charging stations” will be required in the future. However, many gasoline powered cars produced prior to 1955 had generators, not alternators, that kept a consistent charge on the vehicle’s battery. Could something along this line make charging stations unnecessary? And what about the legendary secret carburetor rumored to give a car one-hundred miles to a gallon of gas? There are those who believe that if the United States has the technology to put a man on the moon and send exploratory craft to Mars, that surely engineers must have the ability to develop such a carburetor. However, it would seem that such a device, if it actually exists, would be unnecessary if steam and electric technology from the early 1900s could be updated, and possibly combined, for the new millennium.